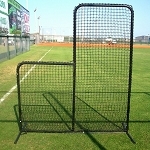 Baseball Screens • Discount Prices • Free Shipping! Whether you are a baseball player or you play softball, screens are some of the best training tools there are. They are great for hitting, fielding and throwing drills. Pitching machines definitely need to be protected. A ball that hits them flush in the wrong spot can forever damage a pitching machine. We carry a Louisville Slugger screen that can be used with baseball or softball pitching machines as well as L-Screens that not only protect pitching machines, but they can protect a coach who is throwing live batting practice. 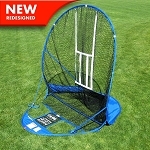 People who want to practice their hitting, whether it is from a batting tee, from a toss machine or from a coach doing soft toss, definitely need a screen to hit their batted balls into. 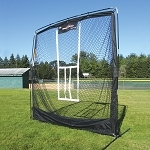 A good batting cage screen will keep your batted balls just a few feet away where they can be collected to hit again. 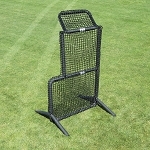 Pitch-back machines allow people to practice their throwing and fielding. 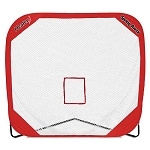 Throw the ball at the screen and it rebounds right back to you - great for not only throwing but fielding line drives and grounders. Sure you can buy a cheap one at WalMart but if you want one that will last for many years, you'll want to get a real one here. Finally, there is nothing like a sock net. Pitchers and anyone from infielders to outfielders can use them as targets. 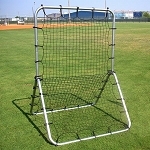 Practice pick-offs and throws to bases and the net will catch the ball every time! 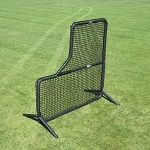 Below, check out our selection of softball and baseball screens. They all feature manufacturer warranties as well as satisfaction guarantees. Any of our screens that are over $100 ship free, too. We're sure you will find the perfect one to suit your needs and budget. And, of course, if you have any questions, please don't hesitate to contact us via our Email form or by phone!